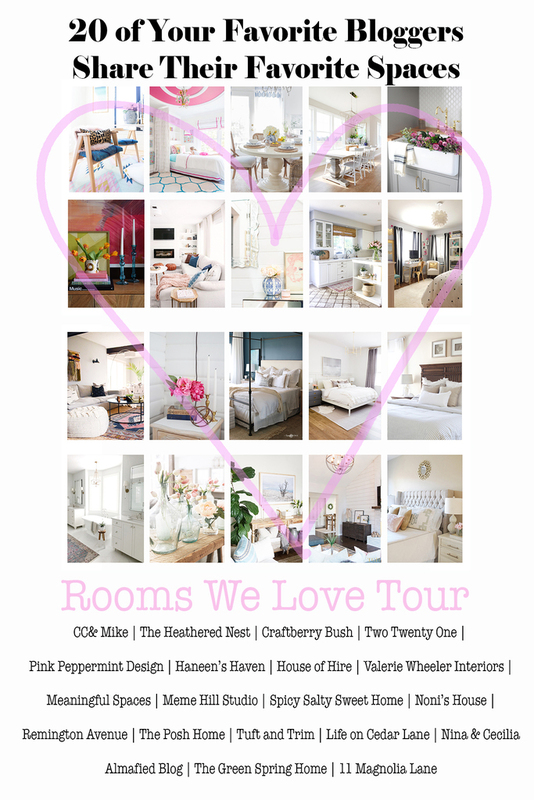 I was asked by my sweet friend Tammy to team up with 25+ other bloggers and share rooms we love throughout the week. I chose our dining area for a couple reason. The biggest being that it’s the most finished room in our house right now. The other reason being that I love the view out the windows and how the dining area is centered in the back of the house across from the kitchen. As a refresher, here’s what the space looked like when we moved in. 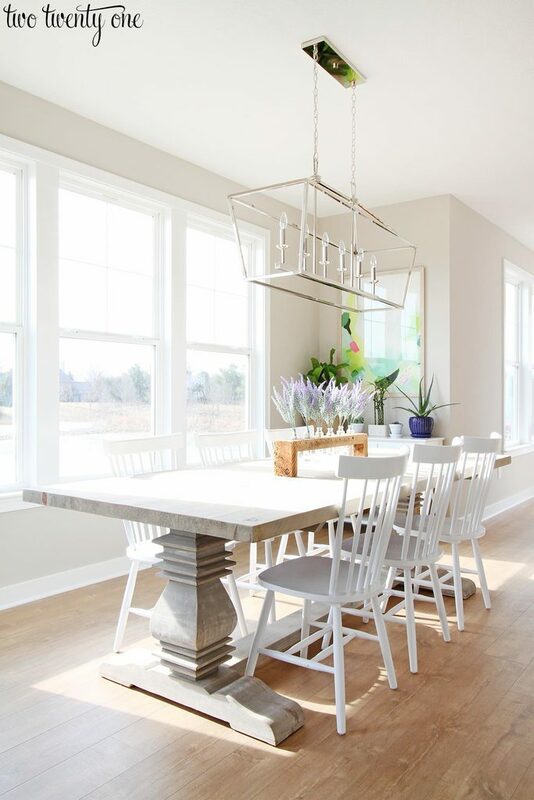 After we selected our floor plan last year, I spent hours searching for a dining table, chairs, and light fixture for the space. I knew I wanted a Restoration Hardware-esque table that could sit 8+ people if needed since this is our only dining space in the house. 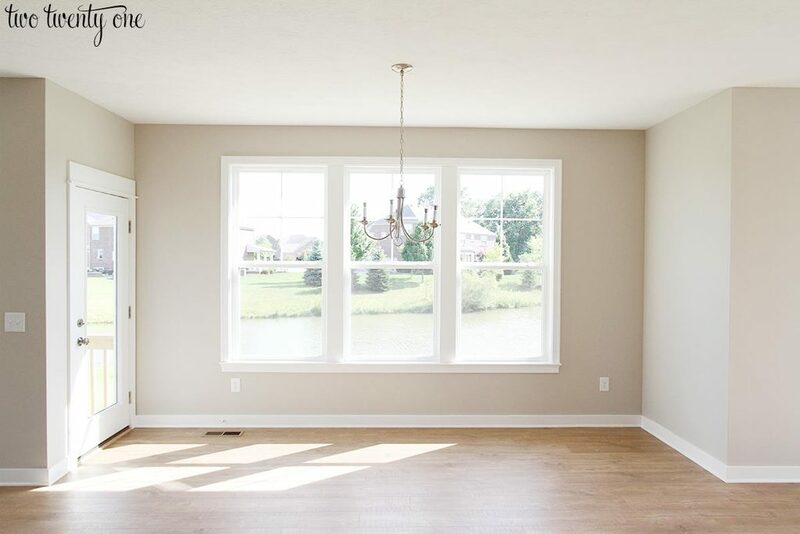 I also wanted white, slat design chairs and a longer, chrome light fixture. I love the dining table but she’s giving me a run for my money. When I purchased the table, I knew it was unfinished, meaning there’s no protective coating on it. So if we were to spill something on the table, it would get soaked into the wood. I got a special sealer to use on the table to fix that issue. Problem solved, right? Well, we’ve had all the issues with the house and then the holidays came, and I never got around to sealing the table. When I was finally going to do it, I removed the tablecloth I had on the table to protect it and noticed that the table is starting to split and crack in some places– I’m guessing from acclimating to our house. I’m currently waiting to hear back from the company on a solution. So just beware that the table isn’t sealed, and it could potentially crack and split. I’ll keep you posted on what happens. 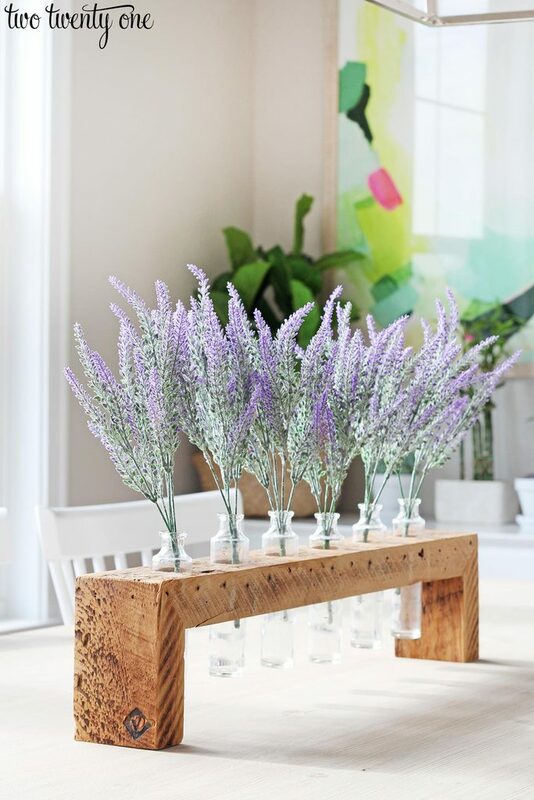 I love this six bud vase, which is handmade out of century old 2×4’s salvaged from demolition homes throughout Chicago. So if you’re a Chicago native, current resident, or just a Chicago lover, I highly suggest grabbing one of these bud vases– they come in various sizes. 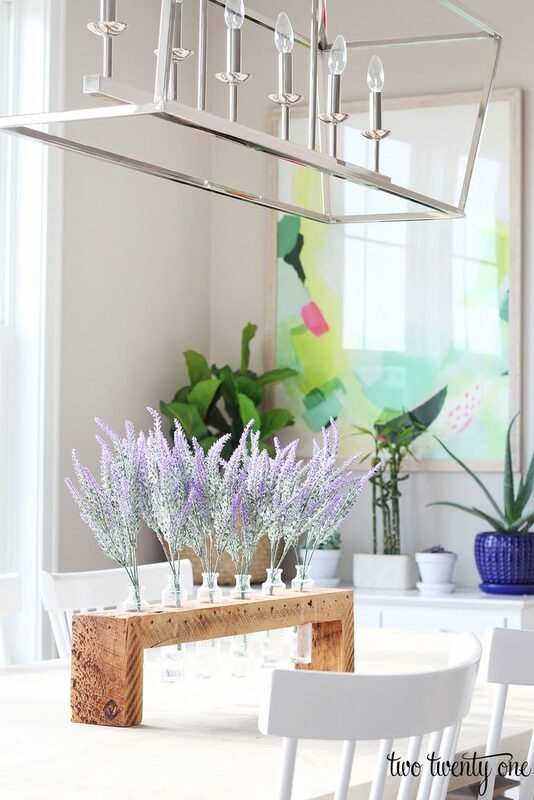 I typically put my favorite– grocery store alstroemeria in the vases, but I recently decided to try out this faux lavender. I really like it, and for being fake, I think it looks pretty good. 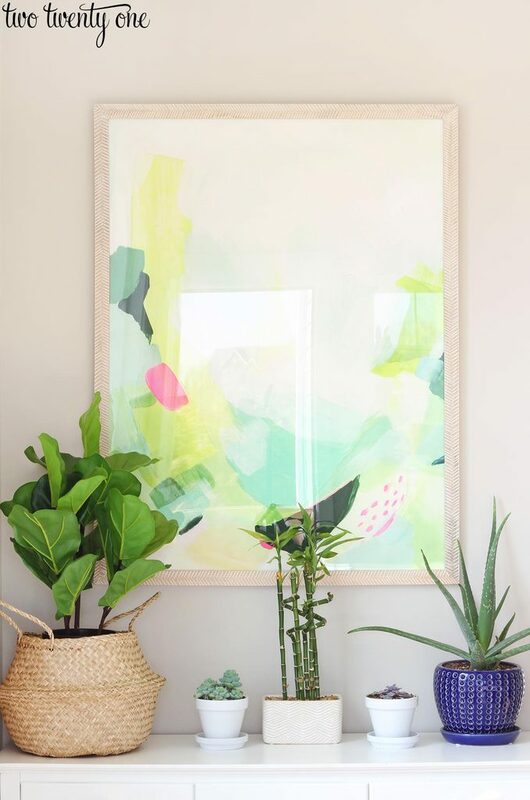 I hung one of my favorite art prints on the small wall in the dining area to give the space a little color. I displayed it horizontally above our bed in our previous house. 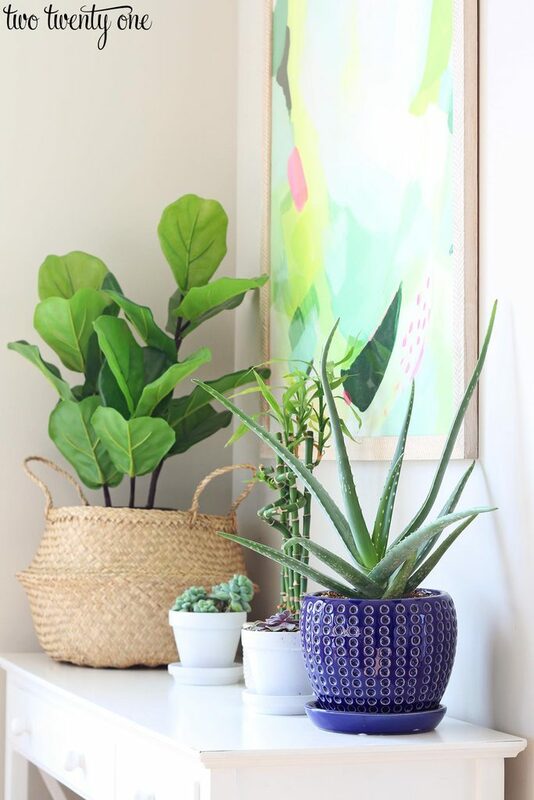 The art print is hanging above our old entryway table, which I now use to house some of my indoor plants. The fiddle leaf fig is fake, but everything else is real. Now that we have so much more sunlight in this house, I’m trying to grow more things inside, especially succulents. I bought the aloe plant last spring when I made over our previous master bathroom. It started to out grow it’s old planter, so I replanted it a couple months ago. (You can see the baby version of the plant here.) It’s quickly becoming a beast. 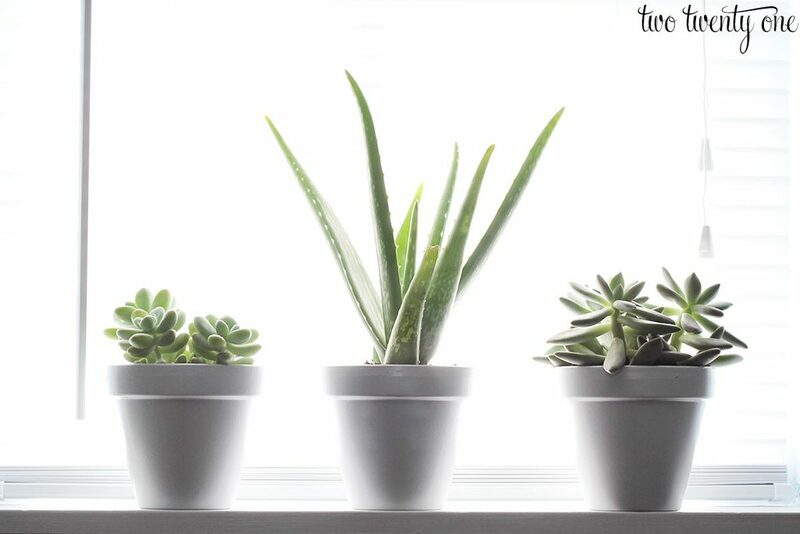 If you’re looking for a very low maintenance plant that loves sun and does well not being watered often (I water mine every other week), grab an aloe plant. They also come in handy when you have a sunburn or skin abrasion. 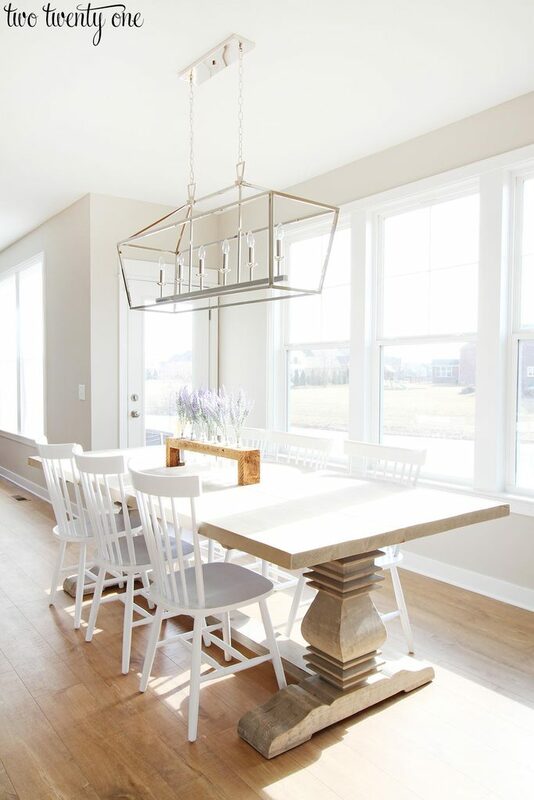 I’m 100% in love with the light fixture. It’s really hard to get because it’s always out of stock. I was on a waiting list for months, and when I got the notification on my phone that it was back in stock, I purchased it in under 5 minutes. You cannot beat the price. I paid $213 for the light back in September. It’s a knock-off version of the $1260 Visual Comfort Darlana light. The chairs are great, and I also got them for a steal– $250 for six. It pays to online stalk prices. Some may think I’m crazy for having white chairs with a toddler, but I prefer white over a darker color because white hides crumbs better. I’m still deciding on window treatments. I wouldn’t mind doing fabric roman shades. It’s just deciding on the fabric that has me paralyzed. I also may add a rug down the road. Since Owen eats most of his meals at our kitchen island, I’m not too afraid of him spilling on a rug. Don’t forget to check out today’s bloggers’ favorite rooms! 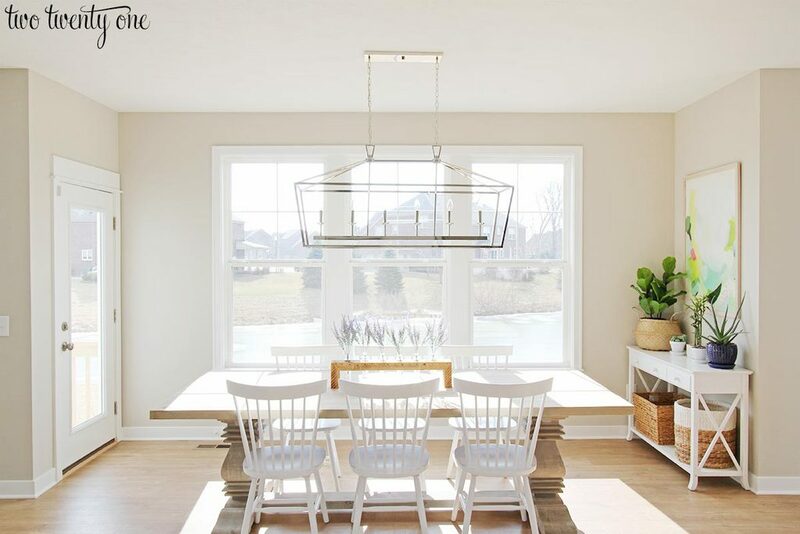 Perfect light fixture to not obstruct your gorgeous view. 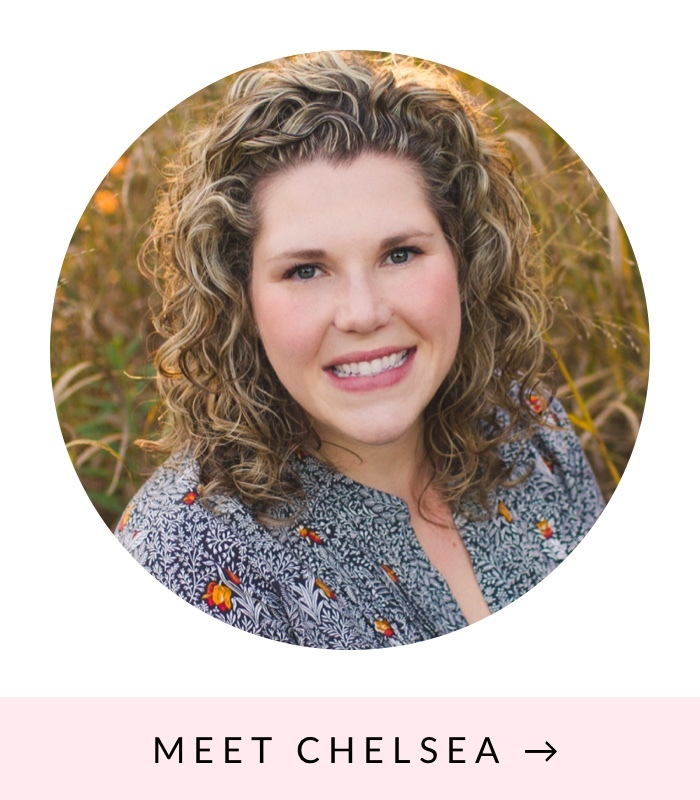 Chelsea, your dining room is GORGEOUS! You are so talented! Pier 1 has a similar table.